Munich, Germany—Currently on trial here for War Crimes is retired Cleveland auto worker, John Demjanjuk. Demjanjuk was simply a Ukrainian fellow who was forced to work for the Nazis or face death. What he may or may not have done is based upon conflicting accusations backed by no real evidence. 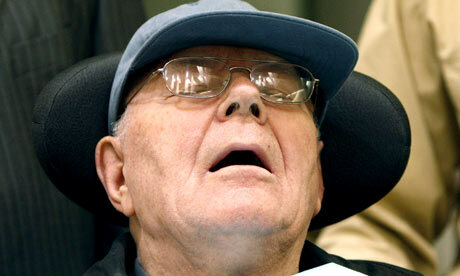 Today, Demjanjuk, 90 is frail and very tired and trying him for wars crimes is taking Germany many months. The trial has been stopped numerous times because of Demjanjuk’s health. Our own Justice Deoartment has a little known agency called the Office of Special Investigations or OSI. They have been given the task of locating and providing evidence against Nazi war criminals hiding in the U. S. The OSI has very little to show for the huge budget they’ve been given. The short version is that the OSI framed Demjanjuk as being a horrible war criminal named Ivan the Terrible, using a forged identity card and a horribly suggestive photo lineup shown to some Treblinka Concentration camp survivors. Stripped of his American citizenship, Demjanjuk was handed over to Israel where he was tried and sentenced to hang. Later an Arizona Department of Public Safety document examiner, Bill Flynn discovered the OSI produced identity card used to convict Demjanjuk was a pasted up forgery. Flynn proved the forgery in court and Demjanjuk was sent home. That was not the end of the story. The red-faced OSI agents soon made a new case. Now they claim that Demjanjuk was a nasty camp guard at Sobibor Concentration Camp. Ironically it’s also is an air tight alibi for the Ivan the Terrible allegations that brought the earlier death sentence. The OSI wrangled through the courts again stripping John Demjanjuk of his citizenship and shipped him off to Germany for a Show Trial that very few are watching. If they convict Demjanjuk his punishment will be to spend the rest of his life in a German nursing home getting very good medical care at the expense of Germany. Demjanjuk is already a broken man without a country so I don’t think the outcome of his trial will make much of a difference. The real losers in all of this are John Demjanjuk’s innocent family members that have suffered for the last 35 years throughout this epic nightmare. War is Hell and the causalities still continue. As for the idea of a mini-series, Hollywood stopped making them nearly two decades ago. In 35 years they have come up with nothing.All hearsay and various "opinions" on handwriting and photographic analysis.